There is one product in everyone’s home that is used quite a bit but spoken about very little – except by people like us. We are talking about toilets. That’s right – the one product in your bathroom that is a silent sentry; when it works well, no one pays it any attention but when it doesn’t – look out! Here at the Ultimate Bath Store, we think of ourselves as the champions of this much-maligned product. So with that in mind, let’s see what’s new in the world of contemporary toilets. 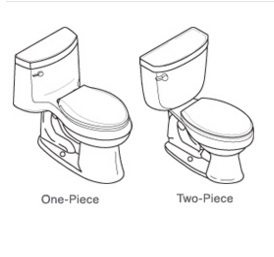 Moving on from water-saving, the other differences in toilet design come down to whether or not you want a one-piece toilet or two-piece. The toilet above is Kohler’s Reve one-piece, WaterSense approved toilet. Two-piece toilets feature the traditional design of a separate tank and bowl. Two- and three-bolt installation systems provide a sturdy, level connection between the tank and bowl, making installation easy. The toilet above, Kohler’s Cimarron (also WaterSense approved) has a number of cool features: it’s a touchless toilet with the no-touch flush for your home. Just hold your hand over the tank sensor to activate the flush. No handle to touch means fewer germs to pick up or leave behind. This Cimarron toilet features innovative AquaPiston technology, a patented flush engine that delivers a fast, powerful, and virtually plug-free flush. 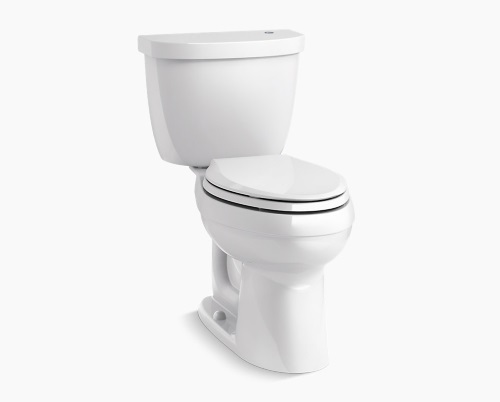 A 1.28-gallon flush provides significant water savings of up to 16,500 gallons per year, compared to a 3.5-gallon toilet, without sacrificing performance. Look, we are all aging, it can’t be helped but what can be helped is making it easier for our older leg muscles. Easy Height toilets, as the name implies, are taller – not noticeably so but enough that when you sit down you do not need to lower yourself into a crouch. Trust us – you’ll appreciate this as you age. Comfort Height toilets, approximately 2 inches taller than traditional toilets, make sitting down and standing up easier. Toilets that measure between 17 and 19 inches in height from the floor to the top of the seat are considered Comfort Height toilets, whereas traditional toilets measure below 17 inches in height. Many Comfort Height toilets are also ADA-compliant when installed per the applicable guidelines. 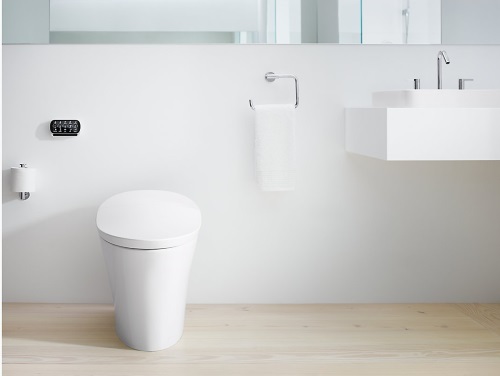 The top of the line toilet (shown at the beginning of this post), is Kohler’s Veil series, which has all the bells and whistles….including a heated seat (ahhhh) and an automatic deodorization system. Right? Everything! It seems as though toilet technology has thought of everything – you don’t even need to TOUCH the toilet to get it to flush! If only they had built-in night lights — if only – but WAIT! Of course they do!! Kohler (and other manufacturers) now have night lights, using LEDs built right into the toilet seat covers! Brilliant (pun intended). Except for perhaps bringing you reading material, we proclaim toilets to no longer be plain and boring!